Tom Okarma (www.tomokarma.com)is a recognized development expert. I find his blogs helpful and practical. Recently he wrote about lessons he had learned “the hard way” about building a successful and focus nonprofit Board. He calls the “Tom-isms” and I have adapted them based on my own experiences. Don’t settle for just anyone simply because you have a vacancy. This may be the #1mistake Boards make in choosing new members. Don’t rush to fill a slot. A solid candidate who adds value is more important than a readily available candidate. If you have a recruitment pipeline you won’t fall into this trap. In addition, you might want to keep a pocket vacancy or two for opportunity candidates who may appear. Good volunteers and major donors do not automatically make good directors. Promoting someone above their skill or interest level can only lead to heartbreak. A great volunteer event coordinator may only want to be just that! Once again, a good interview with the candidate will determine their level of interest and skills. I’m a great lover of and supporter of opera. It would be a tragic mistake to recruit me to sing. Always be on the lookout for candidates. This does not mean interviewing customers in the WAWA. But it does mean having a list of persons who have shown interest, to whom you have spoken (enthusiastically) and who seems to understand and support your mission. Maybe they aren’t interested or available right away but cultivation is a wonderful thing. Strategically recruit to fill specific needs. This is a good time to look at your strategic plan or goals for the next 3-5 years. What support will you require from your Board to lead you there? You might want to do a Treasure Hunt of people you have identified as showing interest as well as individuals in the community who support or have supported similar initiatives. Look for life experiences as well as work and volunteer activity. Travel, language skills, Peace Corps, education are all ways to start. Be mindful of personalities and styles. I always look to see who has good playground skills. You want strong members but not everyone needs to be Type A. The ability to be a part of the solution, take turns, add to the discussion are all important traits. Being first in line every time doesn’t add value. New members need to strengthen the Board, not cause contention. Creative friction is what you seek. Diversity comes in all sizes, shapes, ages and colors. Life diversity is as important as demographics. A Board should never been comprised of all close friends. In many cases that is who is on a founding Board and there is good reason for this. However, as an organization matures Board members need to bring a more diverse background of skills thoughts, experiences and backgrounds to your deliberations. Race, ethnicity and age are all important; also look to clients, vendors and others to broaden the field. In summary, board development is a process. Keep in mind three things. Cultivate individuals to move them form interested to involved to invested. Be mindful of skills and personal qualities needed to make the board fully functional. Diversity will keep your board a true reflection of your community. This recipe may seem difficult at first but it is simple once you have assembled all the ingredients. When friends are invited for dinner this is one dish I’m asked to serve again and again. I have been known to eat it straight from the pot but only before guests arrive. I defend the practice by saying that I’m “correcting the seasonings”. Rub lamb with olive oil, salt and pepper. Heat a large oven proof pot or Dutch oven on the stove and brown the lamb on all sides. Remove the lamb to a plate. Add all the other ingredients into the pot and replace the lamb. Put the bay leaves on top of the lamb. Cover and put in the oven for 4 hours. Remove pot from oven, put lamb on a plate and cove tightly in foil to rest. Strain the sauce into a saucepan over high heat. Bring to a boil and reduce the heat to simmer for about 10 minutes. Put lamb on a platter and spoon over with sauce. The lamb will be too tender to slice so don’t be alarmed. N.B. 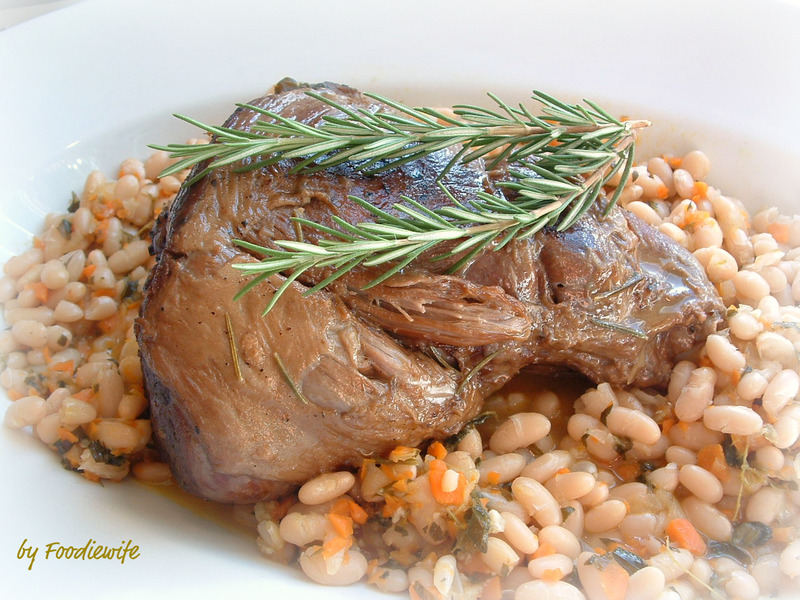 Make sure measure the pot you will use so that when you buy the lamb you know it will fit! Soak the beans overnight in cold water. Drain and place the beans in a large pot with the chicken stock and bring to a boil. Lower the heat and simmer for about 30 minutes until tender but not mushy. Add the salt only in the last 10 minutes of cooking or the beans will be tough. Drain and reserve the stock. In a large separate pan cook olive oil, onions, carrots and celery over low heat for 10-15 minutes until tender. Add parsley, garlic, rosemary and thyme and cook for 1 more minute. Add the beans and 2 cups reserved stock and cook together for 15 minutes. Add water to make the 2 cups if you don’t have enough stock. Taste to correct the seasonings. Remove from heat and finish with the Parmesan cheese. 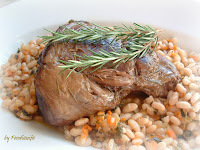 I serve the lamb and beans together on a large platter. You can pass the sauce separately. Bonny Anderson 2013. Simple theme. Theme images by kcline. Powered by Blogger.